“Don’t be scared, there will always be a light”, she heard her worried mother’s voice and then she felt the suitcase closing. Indeed, the light entered from the small hole at the upper right corner, near the worn leash that held it together. If she stretched her head, she might be able to take a look at what was going on out there. At the moment, she tried to hold her tears on the thick cardigan that her parents had put her on. She was a small girl in a suitcase, who was about to make a long journey. Her parents prepared grandpa’s suitcase with some of her stuff. They put in the corners her favorite doll, which she secretly hid in the school bag and had it always with her and the photos from her birthday in the garden two years ago. Her aunt Shayma had come with her cousin Joram and they played together all the afternoon. She remembered that day and in the photo she looked flushed from running. The grown-ups were drinking lemonade and were small talking and she was running with her friends and cousins. She looked carefree and rather happy. In the center of the suitcase there was an empty space. She would squirm there, like a small cat, and would stay there for as long the journey lasted, along with her flask full of water and a bag of ma’amoul with dates. Her father had promised her that he would be the only one to carry the suitcase. “But where are we going?” she asked in big fear. “We have to leave because we are no longer safe here. When you come and sneak into our bed at night because you hear the cannons, as you call them, you tremble like a leaf. We have to make a journey and when we cross a big sea, then you will stop being afraid” her father told her. “But why should I be in the suitcase?” she complained. So, they started their journey that day, at the crack of dawn. 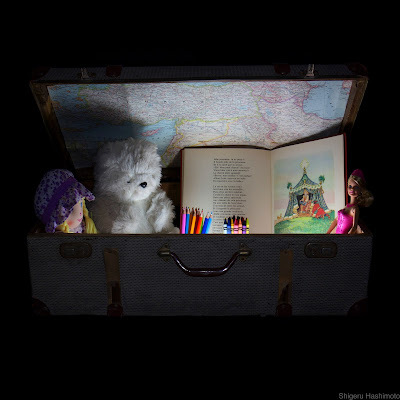 She sneaked in the suitcase and let herself be carried away, feeling the safety of her father’s hand on the handle. Light entered and scattered warmth and a sense of optimism. It was as if she was in the belly of a strange sea monster that shook up and brought all sounds distorted. The girl, trapped in that new womb of another Trojan horse, she tried to listen to the outside world as she clasped the doll tightly. She listened to her father’s footsteps on the street and on the stones. Words like: “Be careful, the road is steep here”, or “We will stop in a while, not here”, were the only ones she heard. At first, his step was vivid, full of energy. As the light was fading out, like the day, so did his step. It was slower and heavier. Her parents walked and led her outside her room, out of her city and her world quietly but with a deafening tension. As much as she wanted to see what was going outside, she could not stretch her head in such a limited space. The content of the suitcase was her micro world. Her journey was a lonely one but she had already walked many kilometers in her own way. Holding her doll tightly, she passed a circus and freed all the chained elephants. They took her on their back and led her to their homes, at the heart of the enchanted forest and helped her climb the trees. Her father would be thrilled to hear all about her adventures as soon as their journey ended. The sun went down and the cold penetrated the suitcase. Her father’s step was getting slower just like her own. The wind hit her face as she hiked on the snowy mountain in the midst of the blizzard. She should not stay behind because the other climbers were far ahead and she didn’t want to get lost with her doll in that white spooky landscape. She was certain that she would be all right, although she was in great agony. Her troubled sleep got her more confused as she found herself suddenly at the bottom of a lake swimming with a school of goldfish with huge tails entangled in her hair and tickling her nose. The light was coming and leaving. Her father firmly held the suitcase and walked with determination towards a new world. She sometimes heard her mother’s voice speaking to her tenderly. Time had taken a different dimension. It unrolled and rolled back like that slinky, for which she was crazy about, when she was younger. She realized that the journey was coming to an end when she swayed with the sea. She tightly hugged her doll with relief and gave herself over to the reciprocating movement of the water that always has a way of imposing itself on the wilderness and fears. She wanted to see her parents so much! This time she wanted to walk with them the path towards the new world. She fell asleep and this time she was calm. Her nails stuck in the doll’s skin as the sea’s lullaby became wilder with the first drops sneaking in the suitcase. She was certain that her father would open it up and take her in his arms. But he didn’t. She panicked. Water continued to get in, in great speed. The sea was getting rough. There was darkness and water everywhere. She started screaming. Someone would listen to her and open the suitcase. With her small hands she started knocking on the walls in order to set herself free. The suitcase was filled with water and despair. No, she could not open it. Her heart was beating like a jungle drum. What had happened? Where were her parents? Would the journey abruptly come to its end? They promised her a new world after crossing the sea. She closed her eyes and, just before water filled her nostrils, she saw from the opening of the suitcase the huge sea monster approaching. She recognized it. She was found in its belly before. Perhaps her journey would start all over again.